Just over thirteen years ago, a young newlywed couple moved into their first home together in the small city of Rockford, Illinois. You could say that it was the beginning of a wonderful journey on which they would earn a couple of degrees, begin careers, change jobs a few times, travel the world a little bit, have a couple of amazing kids, and own homes at various times in three different states. But theirs wasn’t the only journey to have begun in Rockford, Illinois. The Swedish-born inventor John Nelson immigrated to the US in 1852 and settled in Rockford where he worked as a carpenter and cabinet maker before establishing several manufacturing businesses of his own. But it turns out what captured Nelson’s attention the most was the quest for a comfy pair of socks (and who could blame him?). He sold his other manufacturing plants and invested all of his energy into producing a machine that could manufacture everyday work socks for the everyday working man. After partnering with fellow inventor W. W. Burson, Nelson patented his first knitting machine in 1870 and by 1873, the two had created the world’s first seamless sock produced by an automated process. The partnership between Burson and Nelson dissolved, Nelson founded the Nelson Knitting Company, and then he died in 1883. But the quest of sock perfection continued with his three sons. The Nelson boys started Forest City Knitting Company, eventually merging with Nelson Knitting to become the world’s dominant sock producer. Business was humming along, but over the years the industry had attracted a number of competitors, all of them producing brown work socks with a tan toe, top, and heel. To distinguish the original and best out there, Nelson Knitting decided to get a little wild. In 1932 it introduced to the world what it called the “De-Tec-Tip” sock, which was a brown work sock with (and I’m sorry if this sounds a little shocking to more delicate readers) a RED heel. It was certainly a risky move, but the world was ready for it. Within an hour of the first red-heeled socks hitting the pages of Sears & Roebuck, craft bloggers had begun sewing the first sock monkeys, photographing each step to include with painfully detailed instructions. History has forgotten who was first to pin it to their Pinterest page, but Nelson Knitting was rewarded the patent for everyone’s favorite stuffed animal in 1955. 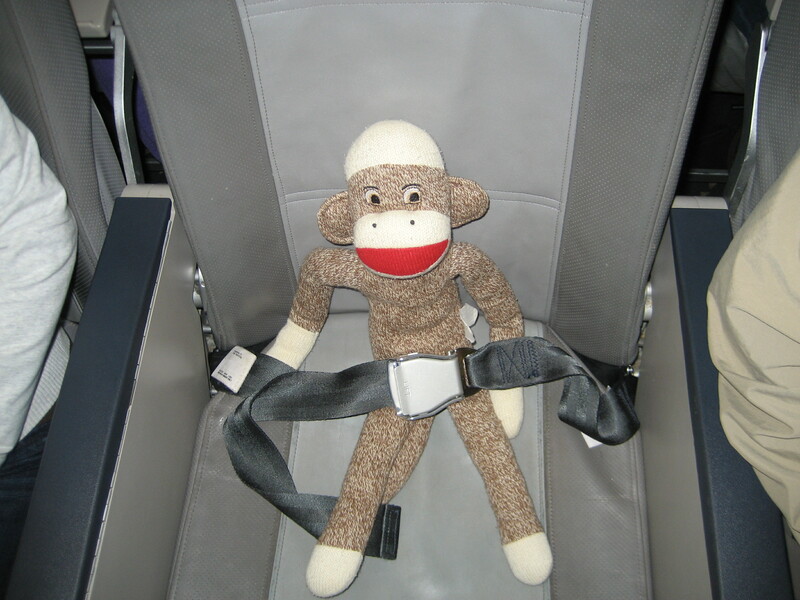 All buckled up and ready for takeoff! No worries, however, for the craft bloggers out there because the patent expired in 1970 and since then sock monkeys have been popping up everywhere. And that’s where our two stories come together. A few Christmases ago, when our sons were very small, my husband received a sock monkey (alas I am not a craft blogger so this one was not homemade). The boys named him “Steve” and he became a permanent fixture in our family culture, taking on quite a mischievous personality (because he is, after all, a monkey). So fast forward a few months. The not quite as young and not quite as newlywed couple got the opportunity to leave their two young children with Grandma and Grandpa and take off for a week together in Hawaii. We had gone away for a weekend a few times, but this was the longest I had ever planned to spend away from my little guys. So I was trying to figure out a way to help them know they were on our minds and feel like they were in some way part of our trip. It was my wonderful mother-in-law (and yes, I do mean that sincerely) who suggested that we photograph a favorite stuffed animal along the way and post the pictures so the boys could follow our adventure. We stuffed Steve in a suitcase and we were off. Steve has been our family’s travel mascot ever since. When either “Mom” or “Dad” heads out for a conference, Steve travels with us. He always shows up on family vacations. He kept family and friends posted during our cross-country move this past year. The crazy thing is that I’ve had several people tell me they would be happy to buy the book. Now, I’m fond of Steve. And I am delighted to know that his journey and ours began in the same place long before our paths crossed and we started to travel together. But I don’t want to get pigeonholed into the sock monkey genre (Worldcat lists 33 new sock monkey entries for 2013-2014) and I do NOT have time to ghostwrite for a stuffed animal. I do apologize to Steve’s many fans out there. A blog post will just have to do. The ladies sure do love him. I was quite honored to meet Steve at OCW and have him sit at my book table. Oh the tales he can spin! 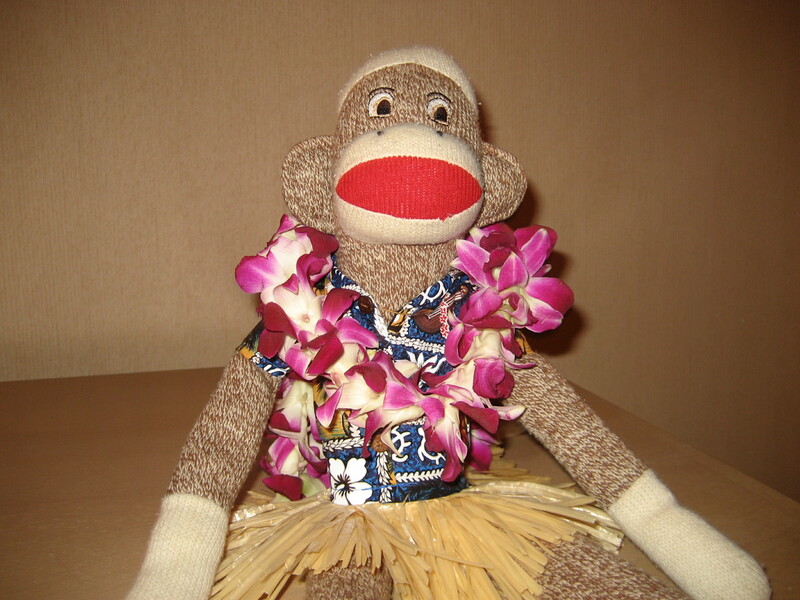 He is a delightful little monkey, always with a big smile for everyone he meets. Steve’s always a good travel companion. The last time my husband went to a conference, he forgot to take Steve with him, so the boys and I took pictures of him doing everything we did at home. It was still fun!